A Straightsell eCommerce Webstore caters for both retail (B2C) and wholesale (B2B) order taking in a single webstore. Straightsell integrates with your existing Reckon data; Integrating Reckon and a Straightsell eCommerce Webstore or online store is crucial for organisations where ongoing website maintenance has become (or is likely to become) a full-time job. Typically, integration is a key requirement for wholesale business to business (B2B) websites or for high volume retail (B2C) websites. Up to 7 point integration with Reckon. ‘Responsive Web Design’ caters for mobiles and tablets. Custom design of your website homepage (add-on). A set list of included changes to the layout and functionality. A dedicated 1 page per product, see example here. Dynamic and multiple product list pages for each product category. Highlight new products, on specials and featured products with Product Showcase. Autosave cart for repeat customers. Allow your sales reps to purchase via phone and tablets with Account Manager Login (add-on). Extensive Promotion Codes functionality (add-on). Cart or Checkout approval processes (add-on). Quick Order Entry for repeat customer orders. Includes credit card and PayPal Express Checkout set-up. Every project includes Content Management System (CMS) and Reckon integration training. Australian based telephone and email support included. Cater for customers using a PC, mobile or tablet. 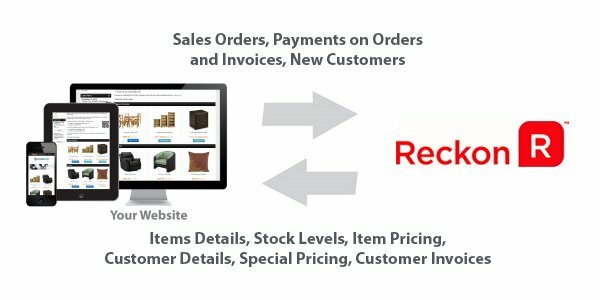 Automate the entry of sales orders; no more waiting for sales orders to be entered by staff. Eliminate the need for printed product catalogues, by providing an online product catalogue, including the customers buy price. Automate entry of credit card receipts for sales orders and invoices. Grow your business, without growing your staff numbers, by automating manual processing. Present your business professionally online. You have a volume of web orders, and every order is paid by Credit card.